Bread Machine Monkey Bread Inspired by Helen Corbitt is a sweet yeast bread mixed and kneaded in the bread machine, then baked in a conventional oven. This blog contains dozens of bread recipes, but this is probably the favorite bread (along with Cheesy-Crusted Yeast Rolls) of my family–especially the grandkids. No bread machine? No worries! Instructions for mixing by hand or with a stand mixer are included in the notes at the end of the recipe. Before children, I worked at The Greenhouse, a luxury health spa back then with connections to Neiman Marcus. Ms. Helen Corbitt, a celebrated chef at the time, had planned all of our menus using her recipes. That’s where I learned about this beautiful and buttery, brioche-like bread. The original recipe was published in Helen Corbitt Cooks for Company back in 1957. Of course, Ms. Corbitt did not have access to a bread machine, but I’m pretty sure she would be thrilled to see how much easier it is mixed and kneaded with a bread machine. Turn them out of the pan immediately to serve. As you can see, this is not the usual biscuits-out-of-a-can-rolled-in-a-ball-then-coated-with-cinnamon-and-sugar kind of monkey bread. Oh no! You don’t have to roll any little balls. This version is not cinnamon-sugary sweet, although you could easily modify it if that’s what you’re after. Don’t be afraid to open the lid after bread has been mixing a few minutes and add flour or liquid as needed to make the perfect dough. After the machine has been on about 8-10 minutes, open the lid and check the progress. Several things might be going on you will want to remedy immediately. As seen in the top left picture above, the dough may be too thin. You could have forgotten part of the flour…as in counted the cups wrong. I’ve done that. Perhaps you substituted a different flour, i.e. 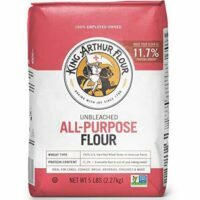 whole wheat, bleached, or bread flour for the unbleached flour. It makes a difference! Add flour one tablespoon at a time until it looks like the bottom picture. 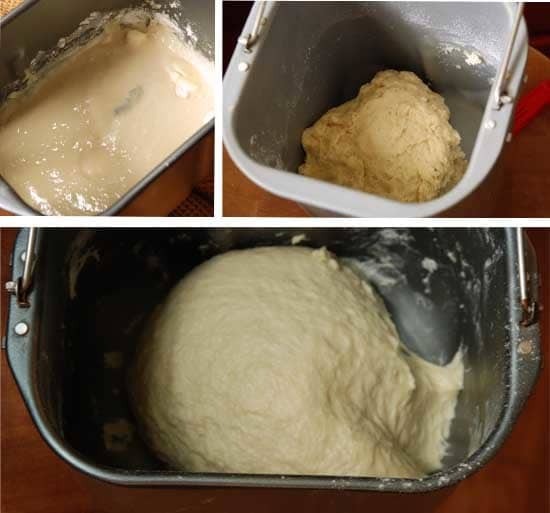 If your dough looks like the upper right picture, it is too dry. It may beat against the side of the pan rather loudly. You have added too much flour or not enough liquid. Maybe you used a smaller egg than specified or perhaps you mis-measured the flour. Add 1 tablespoon of liquid at a time until the dough looks like the bottom picture. The perfect dough will gather up into a ball that sticks slightly to the sides, then pulls away. That being said, there may be slight variations among recipes, for example my Bread Machine Ciabatta. But the recipe will usually tell you what to expect. One more good reason to check your bread is to ensure you have pushed the pan down tightly so the kneading blade is engaged. Otherwise, absolutely nothing will be happening in your pan even though you hear the bread machine running. Likewise, the same thing happens if you forgot to put the blade in the pan. Slice dough into approximately 1-inch diamonds or squares. I do not roll in balls. It’s part of the tradition. In fact, I use a pizza cutter. Please ignore the condition of this pan. 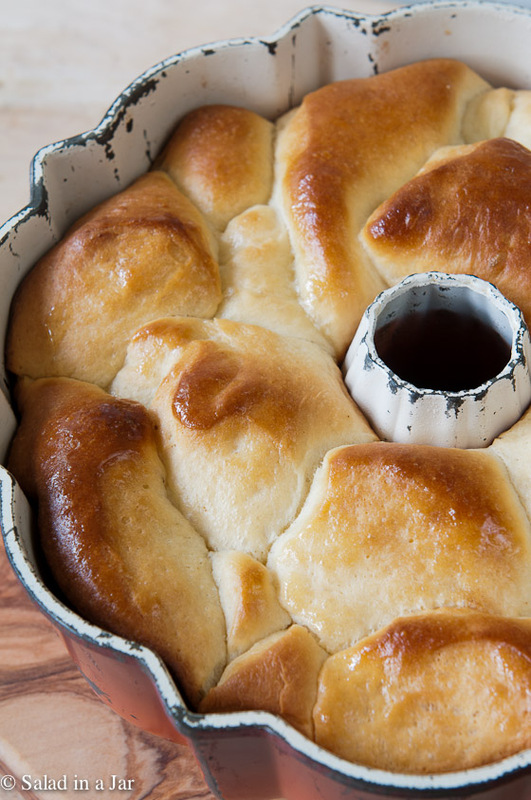 It’s seen a lot of monkey bread in its time. Melt 1/4 cup butter. 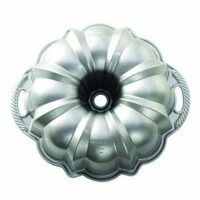 Dip each piece in butter and layer rather haphazardly into nonstick bundt pan. Cover and let rise until double. 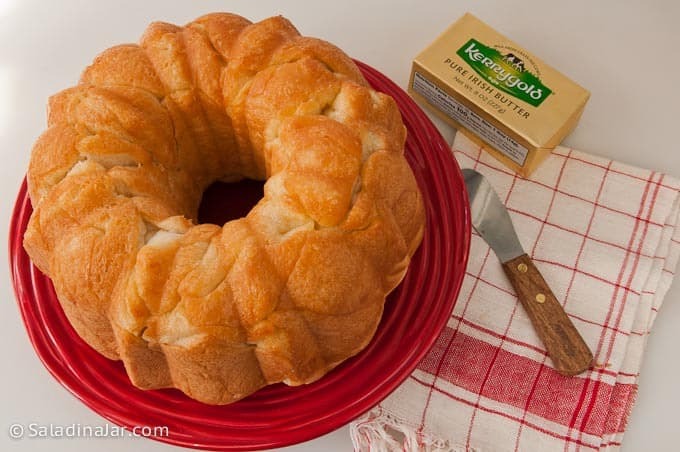 One last word of advice about Bread Machine Monkey Bread: If you serve this on a buffet to people who don’t know about it, they often won’t touch it, thinking it is a dessert or some kind of cake. But once somebody pulls off the first piece, it’s “Katie, bar the door!” because it will be disappearing in a flash. Dump all ingredients into bread machine in order listed. Select dough cycle and start. Check dough about 10 minutes into the mixing process. If too sticky (see discussion below), add extra flour one tablespoon at a time. At the end of the dough cycle, remove bread to floured surface. Roll or press till about 3/4 inch thick. No need to get the ruler. Preciseness is unimportant at this point. Slice dough into approximately 1-inch diamonds or squares. I do not roll in balls. It's part of the tradition. In fact, I use a pizza cutter. Bake at 375 degrees for 30 minutes or until golden brown and/or temperature registers 190 degrees F. Cover with foil after 10 minutes to keep top from over browning. If not as brown as you would like, remove the foil for last few minutes. This burns easily on top, so watch carefully. Turn out onto serving plate. Serve uncut and let people pull off what they want. Hello Paula is there a certain way to mix the dough when doing it by hand? Look online or in a basic cookbook like Betty Crocker or Better Homes and Gardens for a basic loaf of white bread. Mix and knead it according to the directions. After the second rise, come back to my recipe to shape it. One more question, how long does it take to rise? Depends on several factors, especially the ambient temperature. First rise may take an hour or more. Second rise may take 30-40 minutes or more. You want dough to double in size first time and almost double after you put dough in the pan before baking. You can mix and knead dough with a stand mixer, or you can do it by hand if you have the time and energy in your arms. Hi! I collect vintage cookbooks, but they have to have a story and Helen’s cookbooks all sit on my shelf. I loved reading everything about her! I found out about her in an article about the Zodiac Room and the Orange Souffle. I have the Cooks for Looks as well as the Greenhouse Cookbook! I can’t believe women were only given 850 calories a day!! With an exercise routine! For grins, I plan on starting the Greenhouse regime Monday, but I don’t see this amazing bread on the menus!!! =) Beautiful pictures, thanks for sharing!! Hi! Question. Do you know if this recipie makes 1, 1.5, or 2 pounds of dough? My bread machine has to have that in the settings… I guess I could measure the ingredients? 3 cups of flour is roughly 1.5 pounds of dough when making bread. Thank you! I ended up using the 2 pound setting. The bread turned out amazing and my whole family gobbled it up! thank you. I will be saving this! Question – can the “making” part be done on one evening, and the ready to go in the oven Monkey Bread be covered and refrigerated until the following afternoon? I presume that one would have to take it out of the fridge 1 – 1 1/2 hours before you’d normally think it’d need to start rising? After reading so many of your recipes, I finally dusted off my bread machine which I’d used 2 times and my MiL had used once… and started out with the swirly dog recipe – which was voted to “remain on the island!” I was thinking I could prep this for our Wednesday night potluck on Tuesday night, and Mom/DH could pull it out mid-afternoon to warm/raise then bake as normal for potluck? Thought? Hmmm. I’m not sure Bobbie since I have not tried it with this particular dough. Let me know if you do. My personal experience is that dough with potatoes in it works really good this way so I stick with that. Thanks for the response. I love “potato bread” and have the sweet potato rolls on my list of recipes to try. Think that dough would do OK in the “monkey bread” form? Made this (not in a bunt pan-spring form cake pan used) for a halloween party this weekend. Used red icing to top for a “brainy” look. It looked (and tasted) great! I am new to bread machining. This was my 3rd time using the machine (bought used $10). I am SO glad that I found this website. Will be visiting often, probably making each and every recipe you got (maybe twice)! What a cool idea! Perfect for the season. 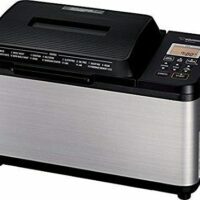 Glad you are enjoying your bread machine. I just made this bread today and have just removed it from the oven. It is taking all that I have not to eat every bit of this. It is just lovely, sweet, and tender. I can hardly wait till my family can get to it. Thanks bunches. I am really enjoying my Zo…. Thank you so much for your recipe! My mom would always make monkey bread when I was a kid! It’s just a buttery, pull apart bread! I am making this now for my husband and little monkey! my grandmother use to make this bread for us when we were growing up many years ago but she didn’t use no bread machine nor do i it sitll turns out great. Thanks for returning to say so. This is the most favorite bread recipe of both of my daughter-in-laws. I think they like not having to worry about making nice shapes. WOW! 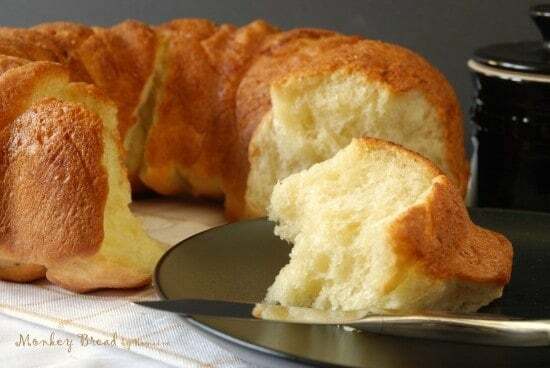 I have been looking for a great (white) bread recipe for the bread machine for quite some time… I also like monkey bread, so this looks like an awesome recipe for me to try…. going to make this today for my “monkies” thanks! Yum, this looks delicious! I may put it on my menu for next week when all the kids are home! I think you went to OCC with my sister, Suzette Hendrix Stephens. I work at OC now. My sister, Jane Buntley, sent me the link to your blog and I love it! I’m going to have to do the salad in a jar trick! It’s my first time here…what a lovely place to be. Your recipe sounds wonderful…and I have 7 monkey children that will love to pull it apart with abandon! Wow that looks wonderful- I think my husband would love that! OOO SOUNDS SO GOOD !